On what has been happening with liberal capitalism, the “carnival politics”, a change of course in the global economy and the role of Russia in these developments. Smiles and tongue-in-cheek greetings at the recent meeting between Vladimir Putin and the adviser to the President of the United States on national security in Moscow were in stark contrast to the meaning of their conversation. The United States announced its withdrawal from the Intermediate-Range Nuclear Forces (INF) Treaty, which means a serious military threat to Russia and the whole of Europe, however, it looked as though they were children discussing some [Soviet children military sports] game Zarnitsa or participants of a TV show competing in wit. And not a single constructive word. But the era of “carnival politics” and political shows exploiting human weaknesses so that to meet the ambitions and complexes of the main actors, will not be long. Such an era cannot be long: political shows do not solve any problems, but only create new ones. We are witnessing the global economy turn from globalisation to reorientation towards local successes. The Trump policy of “lucrative deals” as an alternative to the development of international institutions contributes most actively to this. Thus, in April this year, Donald Trump offered French President Macron a lucrative deal for France’s withdrawal from the EU. In exchange, the US President promised the French more favourable terms of trade than for the European Union as a whole. The example of France makes it obvious that in this way Trump has been trying to force the EU states to abandon a common trade policy in order to reduce their competitiveness. In March this year, the United States imposed duties on imports of steel and aluminum for all countries – 25 per cent and 10 per cent, respectively. In response, the European Union imposed 25 duties on American goods. However, a trade war is exactly what Donald Trump needs. Not so long ago, the US leader announced that the United States did not start a trade war, but had been participating in it for many years. According to Trump, all these years, the Americans were losing in this war, and only in the last year and a half (certainly, with his coming to power) they began to win. Did the victories imply weakening the European Union and NATO, the threats to leave the INF Treaty (see another article “On the Threshold” of October 2018), as well as purposeful sabotage of any efforts on maintenance of the role of such key international institutions as the UN and the WTO? Anyway, all these are clear signs of a change in the course of the world politics. Does it need to be explained that abandonment of the course towards integration and unification leads to devaluation of international agreements that turn into situational and non-binding in the long run? What has already been achieved with such difficulty in previous years and seemingly firmly established by practice — for example, rejection of trade-and-tariff “wars” as a means of balancing bilateral trade flows — turned out to be fragile and reversible in the era of carnival politics. Today, long-term strategies, the horizon of which goes beyond the limits of individual life, are being replaced by the notorious “here and now”, the world economy is returning to the practices that were used a century ago. In general, there is a reversal (the “again policy”): from the idea of shared values based on the best traits of human nature and faith in the power of education and upbringing, to turning into the past, when the world was strictly divided into incompatible and non-mixing segments, related to ethnicity, religion, everyday culture and self-identification of certain groups within society. This reversal has just begun, but the growing pace of the process is impressive (see the article “Losing the Future” of October 2017 ). Last summer, at the meeting between Vladimir Putin and Donald Trump in Helsinki, the parties made loud statements about mutual understanding and trust. But a day later, the US President explained that he had in mind the exact opposite, and the Russian President asked to consider his statements as a slip of the tongue. And as a sign of particularly “friendly” relations, soon after the Finnish summit, Russia demonstrated new types of offensive weapons, and the United States published the Crimea Declaration declaring Russia the aggressor and occupier (see the article “The Politics of the Emperors With No Clothes” of July 2018). In October, the leaders of the two largest nuclear powers went even further, when Vladimir Putin wished painful death to the enemies, and Donald Trump threatened to withdraw from the INF Treaty. Now they write that a new summit of Trump and Putin will take place in Paris on 11 November. The Presidents of the United States and Russia will come there to participate in celebrations to mark the 100th anniversary of the end of the First World War. Is not is a carnival? The two men pushing the world to a third world war will come to celebrate the end of the First World War? What will they talk about? As everything just got worse after their meeting in Helsinki. By the way, the famous Trump and Kim Jong Un summit in Singapore this year, which international community focused on, ended ingloriously. But Trump has no awareness of a failure. The second US – North Korea summit, which is unlikely to be any different from the first one, is already breaking onto the top of the world agenda. Thus, the norms of communication developed by the post-war decades and the corresponding taboos are being blurred. And this is also part of the carnivalisation of politics. It is the carnivalisation which allows not to attach importance to words, constantly swap allies and enemies, easily move from insults to fraternisation and vice versa, and most importantly, abandon the very idea of achieving big common goals. Policies, the international policies inclusive, are divided into a huge amount individual plots and sub-plots. These stories remain in the field of view of politicians as much as they are capable of holding the interest of the media. And the interest of the media is kept exactly as long as the interest of a sated consumer to these topics is maintained. At the same time, the fundamental meaning of politics – reconciliation of conflicting interests and the search for a common vector leading society to development – is lost in the continuous change of top-rated plots. Politicians are increasingly less busy in identifying social problems and solving them, and increasingly interested in public campaigns, creation of spectacular media images and political technologies. Meanwhile, the system of international politics has been falling apart. 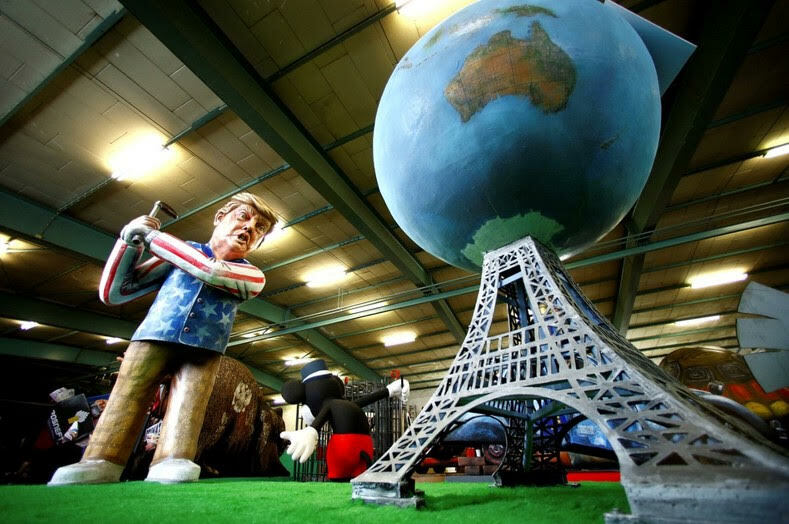 At the G7 summit in June this year, Donald Trump trolled his Western partners and threatened that the United States would leave the Group of Seven. The American President forced his partners and allies to participate in his meaningless and often harmful games. Meanwhile they had to save appearances and give in, despite the growing bewilderment. Distinct patterns of interests are receding into the past against the background of these developments. The military-political blocs are also turning into a fiction – today it is already impossible to believe that someone will fight against someone in a real, not a PR war. But how could it be otherwise, if the US President was making public clashes with other member countries of the alliance because of financial participation during the past NATO summit? Once again, Donald Trump was pouring threats to withdraw from the block (see the article “The Trump Show” of July 2018). It is indicative that the new political reality, created in recent years by the efforts of those who today are its main beneficiaries, acquires its own logic, breaking free from the control of its architects and builders. It was approximately like this with Mikhail Gorbachev’s perestroika. The last Soviet General Secretary [of the communist party and head of the state] also initiated the developments that further not only went out of his control, but also acquired a scale that Mikhail Sergeyevich [Gorbachev] did not even think about. However, the situation in the USSR developed positively in the late 1980s: there was a motive and a vector of movement into the future, towards freedom, openness, and dialogue with the world. Today in Russia this movement is somewhere sideways or even reversed – in the direction of isolation, xenophobia, an arms race, and preparation for war. The most striking example is British Brexit, a decision with multiplying negative consequences. Thus, the exit of Great Britain from the European Union was not a way to safely escape from the traps of the modern world, but a trap set for itself. Moreover, the “special relations” with the United States had been developing much better as long as Britain had been maintaining its “peculiarity,” its face and place in the international politics, while remaining part of the EU. The point here is not even Donald Trump, but the fact that this unique position of Great Britain has been lost and no one understands where British politicians are leading the country and what their goal is. However, one goal of the Theresa May government and the EU leaders is obvious – to mitigate the consequences of Brexit. But Brexit is not a natural disaster, not a plague, brought by alien rats, but an immediate result of populist nationalist politics. Perhaps this is the first major decision taken in practice by a European nation based on the post-truth propaganda. It becomes clear that the position that seemed honest and noble in a British way, now, immediately after the vote (“this decision is democratically made and must be implemented”), looks increasingly controversial due to the new circumstances that are opening. The 700,000 demonstration in London for revising the decision on Britain’s exit from the EU is only a first step towards realising the need to live and act in a completely new situation. Or, for example, the very recent voting in Brazil for right-wing fascist politician Jair Bolsonaro is a choice directly dictated by a sense of a lost future. Or people in Honduras guided by the same feeling and striving for a better life, literally went on a march to Washington. For the United States, this is the same as the [large flows of] African and Middle Eastern migrants for Europe. And this is only the beginning. The so-called actors of carnivalisation of politics may not be seeking to destroy the system that they call a “liberal democracy”. But they are launching the developments incompatible with it. The political system was more or less fully formed in the developed part of the world by the end of the 20th century (no matter how you call it), shaped as a result of the victory of the rationalistic concept of the state and the tradition of humanistic enlightenment, that is, the concepts that are incompatible with the world of “postmodern” and “post-truth” which, on the contrary, is based on the irrational reactions of the passive majority and efficient high-tech social manipulation. However, such a world will inevitably find itself at the mercy of the mercenary and irresponsible manipulators. This new world certainly will be neither comfortable, nor fair, nor safe. What role does our country play in these developments? By and large, the historic chance for Russia could be the role of one of the leading forces opposing this new dangerous trend. There are few applicants for this role: almost all world leaders are either involved in these potentially destructive processes or are too anxious about their own private or regional problems. Some, like, for example, China, on the contrary, arrogantly regard the ongoing historical reversal as a chance to rise at the expense of the rest of the world. Only they are unlikely to succeed. However, Russia, as it has happened many times in history, is missing its chance. Instead [of using it], all forces have been thrown into confrontation with the Western world. This year, the Central Bank of the Russian Federation withdrew almost all of the funds invested in American debt (by the way, the Central Bank had earned good money on this investment) probably fearing blocking in the United States. It can be assumed that the country is preparing for some new steps and adventures that could provoke immediate and severe sanctions from the United States. Maybe this is a preparation for war? But who needs war, you may ask. But who needs to distract attention of the people from the pension robbery [the Russian government arbitrarily raised the pension age without discussing it with the people or raising the pensions], stagnation of the economy and complete futility of the current policy; to teach all these foreigners “what is what” and show them one’s personal coolness, and also seek recognition for Russia equivalent to that of the USSR after the Second World War; to try to divide the world into spheres of influence and be on equal footing with global leaders, despite less than 1.8 per cent of the world GDP from Russia; and to keep themselves in power for life? And one more stroke. In the summer, a piece of news appeared in the media: the Ministry of Defence of the Russian Federation planned to register all passenger cars with a capacity of up to eight people and owned by individuals, so that to use them if martial law is imposed. Certainly, the Defence Ministry later refuted these reports. Posted: December 4th, 2018 under Russia-Eu relations, Russia-US Relations.